VIPAccessEXCLUSIVE: Jaheem Toombs Updated Interview With Alexisjoyvipaccess At The 2016 Nickelodeon Kids’ Choice Sports! If there is one actor who always brings an outstanding energy both on screen and off, one actor we all instantaneously think of is the magnificent Jaheem Toombs! We know the awesome Jaheem Toombs for exhibiting his one-of-a-kind and exceptional talent in Nickelodeon’s highly-acclaimed and marvelous show, 100 Things To Do Before High School. Jaheem Toombs and his great chemistry with his cast-mates made every episode so fun and entertaining to watch, and we all never wanted the episodes to end. *Cue our full-day long 100 Things To Do Before High School marathons* In addition to his great work on-screen, Jaheem Toombs is also a spectacular theatrical actor. He just recently took on the role of Aladdin in his school’s play and he truly did such a mesmerizing job. He showed that he can take on all types of acting – television, theatrical, and beyond, and do such a sensational job! Of course, we can never forget about his awesome orange carpet looks every time he attends an event. Jaheem Toombs is absolutely phenomenal! 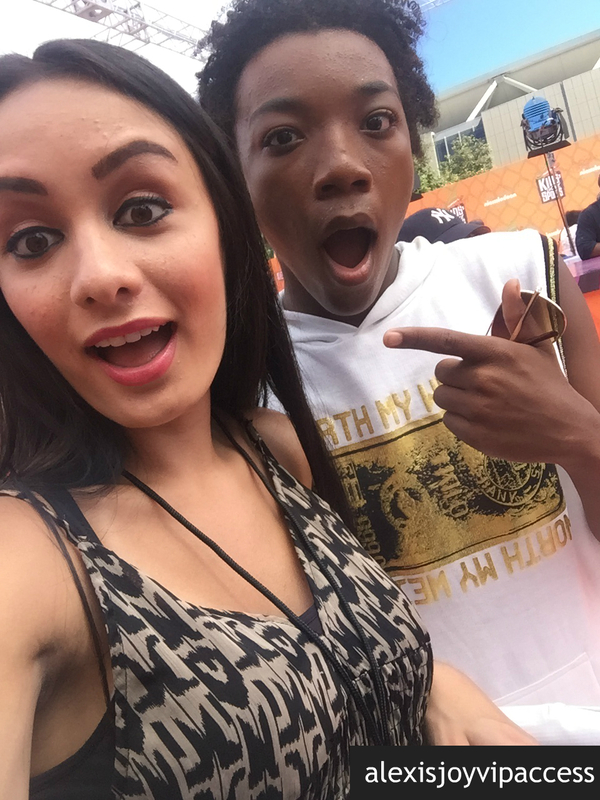 I, Alexisjoyvipaccess had the greatest honor of covering and attending the 2016 Nickelodeon Kids’ Choice Sports again, celebrating everyone’s favorite iconic sports stars and sports moments; and I had a blast catching up with and interviewing the wonderful Jaheem Toombs again at the event! Jaheem Toombs dished exclusively to Alexisjoyvipaccess all about who are two sports stars he’d like to add onto his sports team, what is one sport that he hasn’t tried yet but would like to try, and so much more only in our VIPAccessEXCLUSIVE updated interview. Jaheem Toombs even shows us all his epic gold sneakers – see it all happen in our VIPAccessEXCLUSIVE updated interview below. Thanks for another fun interview, Jaheem – always a terrific time chatting with you! Check out my VIPAccessEXCLUSIVE updated interview with the fantastic Jaheem Toombs at the 2016 Nickelodeon Kids’ Choice Sports below! Previous VIPAccessEXCLUSIVE: Detroit Lions’ Marvin Jones Jr Updated Interview With Alexisjoyvipaccess At The 2016 Nickelodeon Kids’ Choice Sports! Next VIPAccessEXCLUSIVE: Sean Ryan Fox Interview With Alexisjoyvipaccess At The 2016 Nickelodeon Kids’ Choice Sports!